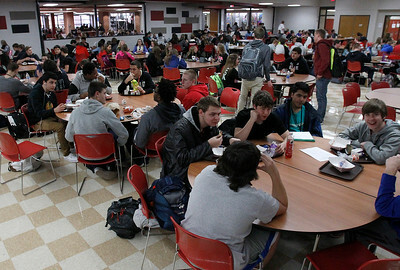 Matthew Apgar - mapgar@shawmedia.com Students eat inside the cafeteria on Tuesday, Jan. 19, 2016 at Huntley High School in Huntley. Huntley High School is maintaining a very low cost-per-pupil ratio. 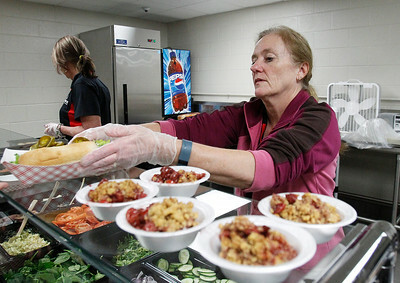 Matthew Apgar - mapgar@shawmedia.com Cafeteria employee Margaret Wesemann hands over a sub to a student on Tuesday, Jan. 19, 2016 at Huntley High School in Huntley. Huntley High School is maintaining a very low cost-per-pupil ratio. Matthew Apgar - mapgar@shawmedia.com Cafeteria cashier Deb McGowan works the register during lunch time on Tuesday, Jan. 19, 2016 at Huntley High School in Huntley. Huntley High School is maintaining a very low cost-per-pupil ratio. 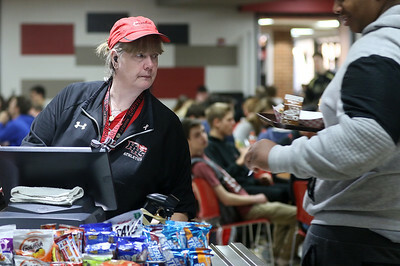 Cafeteria cashier Deb McGowan works the register during lunch time on Tuesday, Jan. 19, 2016 at Huntley High School in Huntley. Huntley High School is maintaining a very low cost-per-pupil ratio.